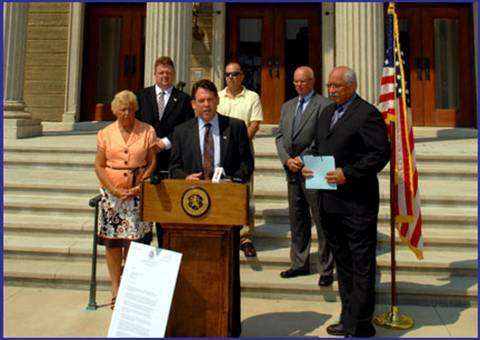 Nassau County Legislator Francis X. Becker, Jr. joined with fellow Legislator, Dennis Dunne, Sr., to call upon local and federal officials to investigate the cases of 97+ veterans who may have been cheated out of benefits for the past 6 years due to the failure of the previous Director of Nassau Veterans Services to file veteran benefit applications. In his first month as Director of Veterans Services, Michael Kilbride discovered that 97 veterans’ applications for benefits had been stuffed in boxes and ignored for years. The applications dated back as far as 2005. With the help of Legislator Dunne, a former Ranking Member of the Veterans Committee, Mr. Kilbride personally delivered each neglected application to the U.S. Department of Veterans Affairs in Manhattan for immediate filing. Vietnam War Veteran Fred Kastner was one of the veterans whose medical benefits were not submitted. “I applied for benefits for my service-connected heart condition in January of 2010, but my paperwork was not filed. I went to the veterans’ office and called numerous times, and was constantly told it ‘just takes a long time to file claims’. By September, my papers still weren’t filed. I believed that the people at the Nassau office would process the applications they took from me. I am owed my service-related benefits, and I am angry,” said Mr. Kastner. The Legislators have written to Senator Charles Schumer, Senator Kirsten Gillibrand, Congresswoman Carolyn McCarthy, and Congressman Peter King seeking assistance at the federal level to help these 97+ veterans by back-dating their applications to the dates they were originally submitted to Nassau Veterans Services instead of the date that Mr. Kilbride discovered and delivered them in 2011. The Legislators also wrote to Nassau County District Attorney Kathleen Rice and U.S. Attorney General Eric Holder asking for an investigation into any possible wrongdoing within the Nassau Veterans Services office under the previous Director, Pat Yngstrom. Since discovering the boxes of forgotten applications, Mr. Kilbride has also uncovered 31 additional errors in veterans’ applications within the office’s files. Mr. Kilbride urges each Nassau veteran to review his or her benefits to make sure that all paperwork was properly filed. If any veteran has concerns or questions about benefits, please go to the Nassau Veterans Services office at 2201 Hempstead Turnpike (in the Nassau University Medical Center, Building Q) or call 572-6560 to find out if you have been impacted by previous errors. Pictured: Nassau Legislator Rose Marie Walker, Veteran Services Director Michael Kilbride, Legislator Dunne, son of former WWII veteran Navy Lt. Marie Wasko, Charles Wasko, Vietnam War veteran Fred Kastner, and Legislator Francis X. Becker, Jr.